Well goodness, that recipe title is a mouthful, huh? I really should have come up with a snazzier name. If y’all have a good idea for one, let me know. But really, the name doesn’t matter all that much. The taste does, right? I was so thrilled with how this came out. It’s a very simple recipe but it is a fun and new way to eat your meat and potatoes. It ain’t the prettiest meal you ever saw but it sure does taste good! With this recipe, we are definitely thinking outside of the bun. Feel free to add in any other veggies or seasoning that you enjoy. Green peppers or red peppers would be great in this! Note: you can substitute the shredded hash browns for southern style hash browns, which are the smaller cubed potatoes or you can use the Potatoes O’Brien that have peppers and onion mixed in with the cubed potatoes. Spray your 5-qt crock pot (slow cooker) with nonstick cooking spray. 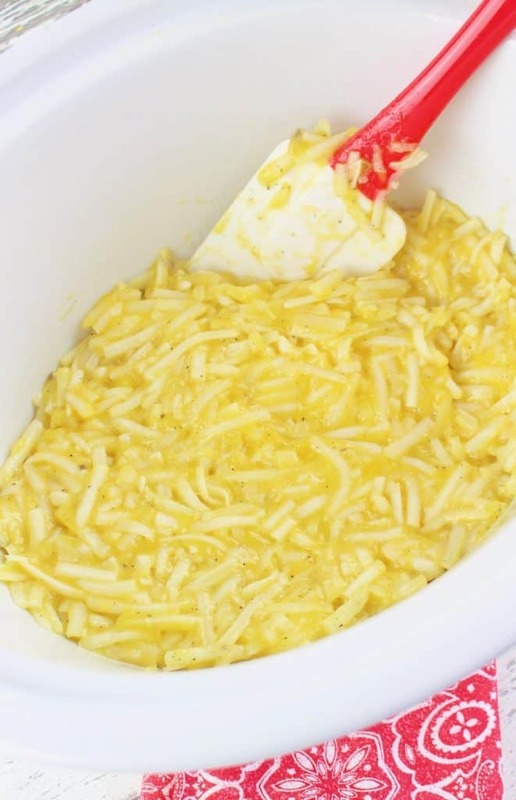 In a large bowl, combine shredded potatoes with the soup, egg, salt & pepper. Stir well then spread it in the bottom of the crock pot. In a large skillet, over medium heat, brown and crumble ground beef along with chopped onion. Cook until beef is no longer pink. Drain excess grease. Stir in sloppy joe sauce. 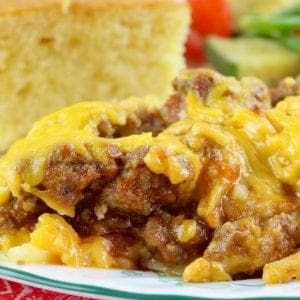 Spoon sloppy joe mixture over hash brown mixture in crock pot. Cover and cook on low for about 4 to 4 1/2 hours. 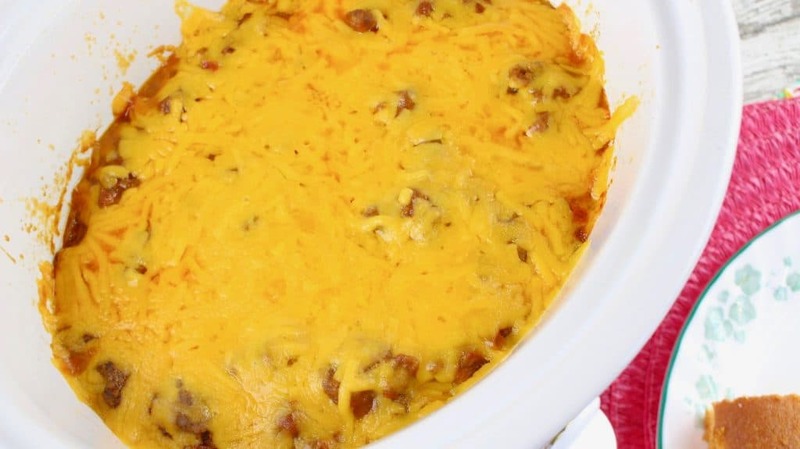 If you’d like, about 10 minutes before it is ready, add about a cup of shredded cheddar cheese to the top of the casserole. Then put lid back on crock pot and allow the cheese to melt. 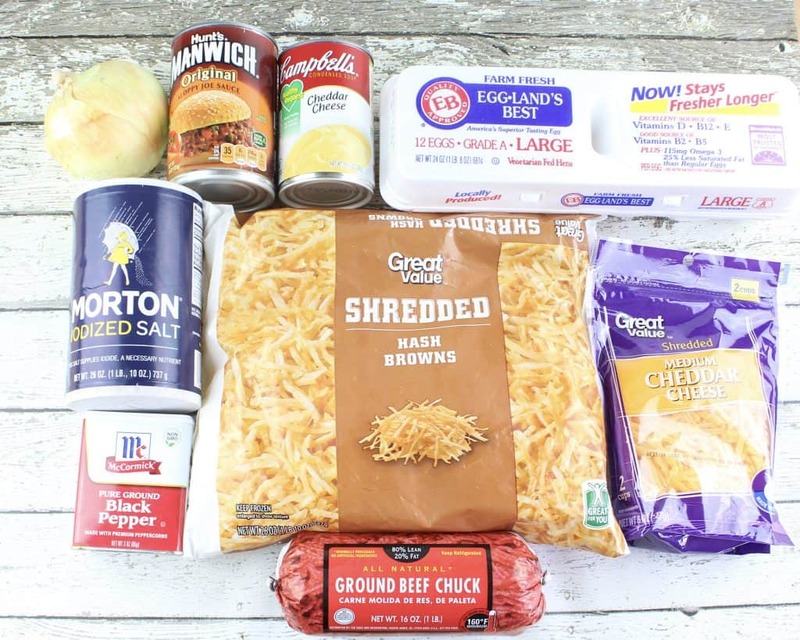 Crock Pot Sloppy Joe Casserole is a super easy casserole to make! 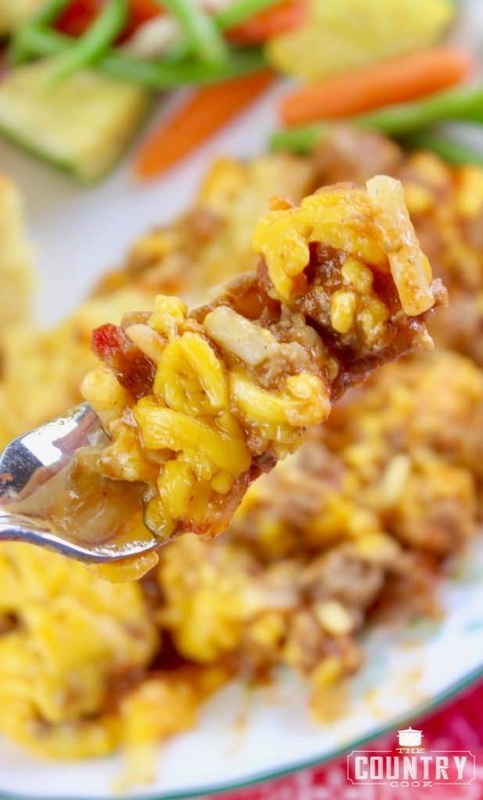 Layers of cheesy hash browns, ground beef and sloppy joe filling make it a whole meal! 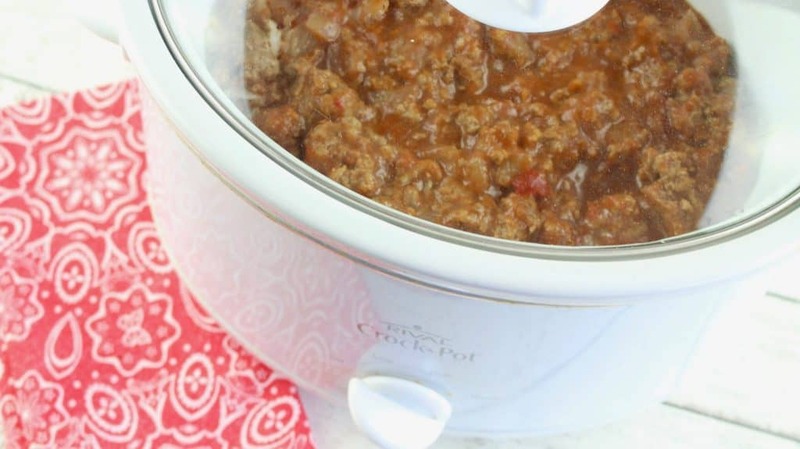 Spray your 5-qt crock pot (slow cooker) with nonstick cooking spray. In a large bowl, combine shredded potatoes with the soup, egg, salt & pepper. 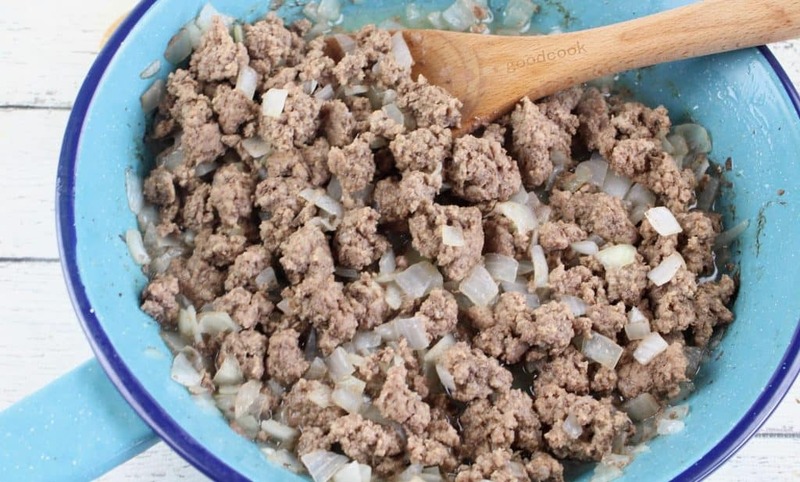 In a large skillet, over medium heat, brown and crumble ground beef along with chopped onion. Shredded hash browns can be substituted for southern style hash browns, which are the smaller cubed potatoes, or you can use the Potatoes O'Brien that have peppers and onion mixed in with the cubed potatoes. If you'd like, about 10 minutes before it is ready, add about a cup of shredded cheddar cheese to the top of the casserole. Then put lid back on crock pot and allow the cheese to melt. This looks delish!! I wish it was one that could cook all day while I am at work! I will have make it over the weekend 🙂 Thanks for posting! This could be done in the oven too if you prefer. But yes, definitely not one that could simmer away all day while you are at work unless you have a digital one that can automatically switch over to the "keep warm" setting after it has cooked. How long and at what temp would you cook this in the oven? Hi Rebecca! I haven’t made this in the oven so I can’t say for sure. I would start it at 45 minutes at 350f degrees and then check it. ???? If it was cooked in the oven, do you know what temperature and how long it would cook for? Looks good! I see you spray your crock pot. If you haven't tried the crock pot liners, this would be a good dish to use them on. They can be found in the foil aisle and I will never be without them. Ya know, I have tried those and they are neat. I just don't always remember to pick them up and I always have nonstick spray on hand. They do make cleanup super easy though! Hi Kay! 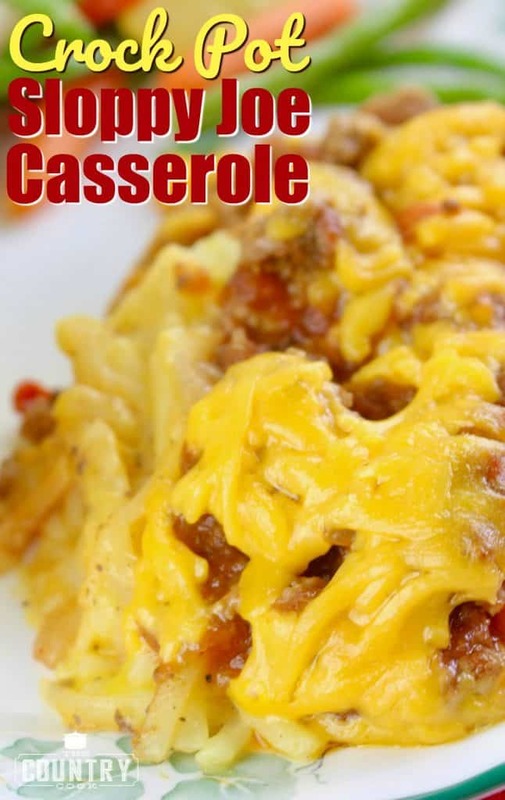 I think anything light would work great since the casserole is very filling. I just served it with some steamed veggies (squash and zucchini) or maybe a salad? I try to get some veggies in though with every meal. I know before I even make this my husband is going to love this. I'm going to throw some chopped green peppers in it too! Thanks! Oh yes, green peppers would be fantastic in this! That's very close to my shepherd's pie recipe. I use mashed potatoes with some canned veggies (peas,carrots,corn)mixed in , then topped with the sloppy' beef which is then topped with cheez slices,covered and baked @350 for 45min. I put it together in a bread loaf pan or a 9×13 dish. 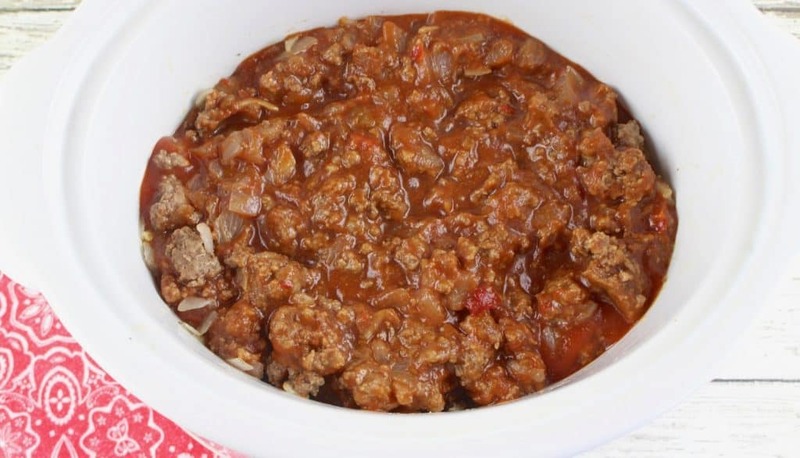 If you want to soup it up add a small jar of mild or medium salsa to the beef. Will have to try that one! Sounds delicious! I struggle with naming recipes too, I desire to have cute names, but the people gotta know what's in the recipe; if they don't know, they're probably not gonna stop by to read it! So I'm just gonna say that your recipe is aptly named and looks totally yummy! 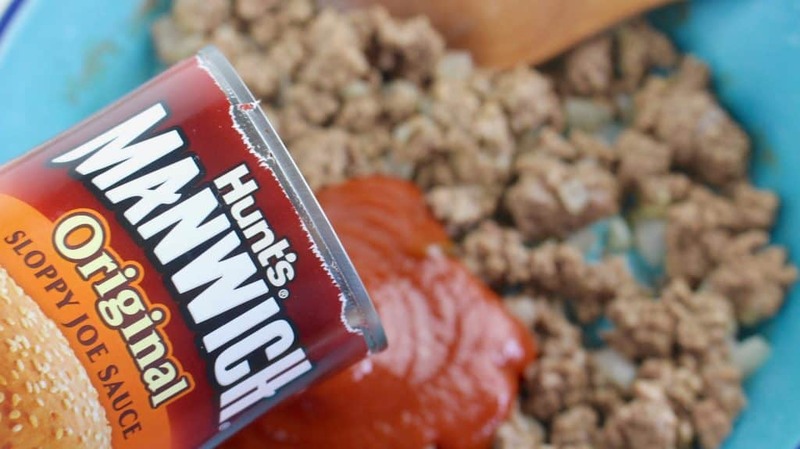 I tried this with leftover pork bbq (instead of Manwich meat mixture) and was delish! I enjoy reading your recipes, and seeing how simple most of them are, and even though I am retired now, I still search for the easiest so I have time for other things in my life. Thanks for sharing all these! 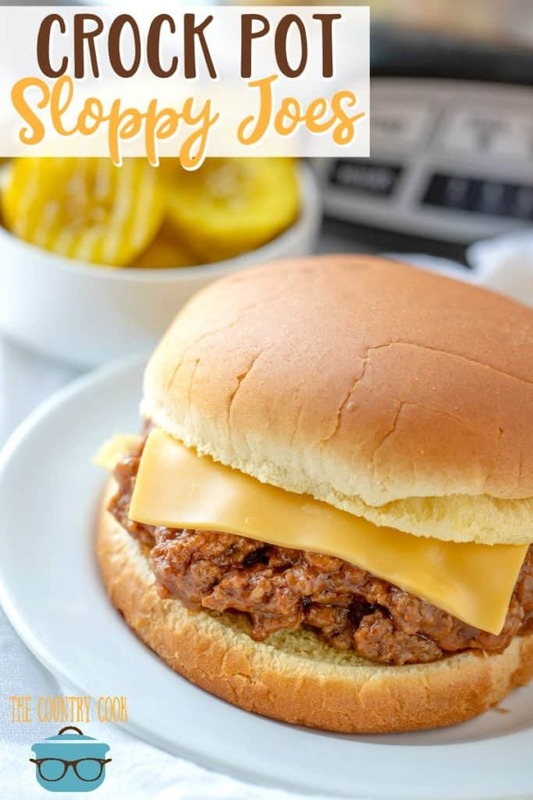 My daughter loves sloppy joes and would love this. However, she can not have gluten and the cheddar cheese soup contains wheat. I have never tried it so I'm not sure what to use in it's place. Do you know what I could use in place of the soup? I like the name! It rhymes and I love that. I am definitely trying this! I didn't have any type of hash browns in hand, so I totally used a small bag of French fries lol. It's still cooking so we'll see what happens. P.S. I like the name, it's informative and it rhymes! @Melissa Corson – If you are a regular crock pot user, you will probably find a lot of recipes that call for "cream of" condensed soups. Those soups are just a basic white sauce with stuff added, like cheese or mushrooms. You start by melting butter in a pan on a medium heat – try 1/2 a stick. Don't let it get too hot. Once it melts, quickly whisk in some flour – maybe 1/8 cup to make a paste. Then immediately add milk and keep stirring til it's the right consistency. Add more milk as needed. 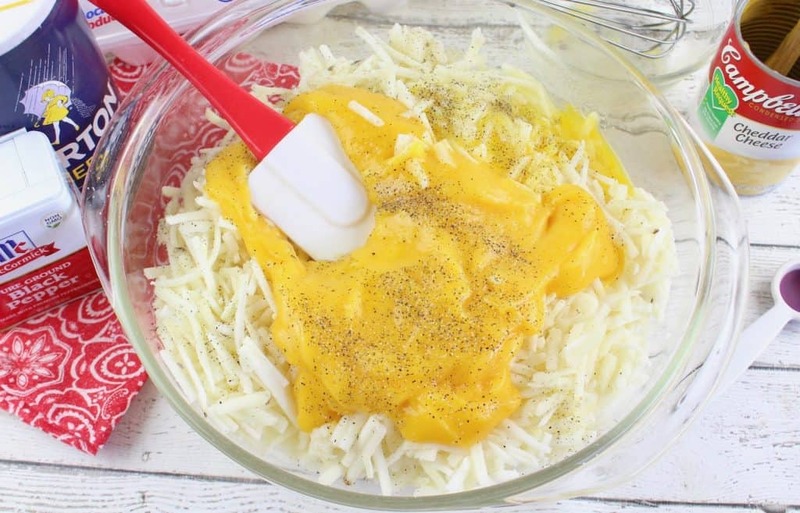 You can add more starch if needed – just whisk it in so it doesn't get lumpy. Turn it off and take it off the burner as soon as it gets thickened enough. You can interchange ingrediants, so instead of the flour you can use any kind of starch, like rice flour or rice starch. Or you could probably use a gluten free alfredo sauce if you can find one in a bottle, which is just a twist on the same basic formula. I can't wait to try this! Do you think I could double the recipe in th crock pot and it still work? Delicious… I used the McDonald's style hashbrowns and broke them into small pieces. Plus, it tastes just as good as a leftover. Love reading how you make this your own!! And anytime the kiddos love it, it's the best compliment in my book!! I apologize if someone already asked this, but is the egg a must in this recipe? I have this thing about cooking with eggs…I'm always afraid I'm going to find bits of scrambled egg in the dish and it'll be gross. (I sound like I'm five, don't I?) It sounds DELICIOUS and I plan to try it this week, but I'd love to leave out the egg. The egg helps to bind it together but you can leave it out if you prefer. 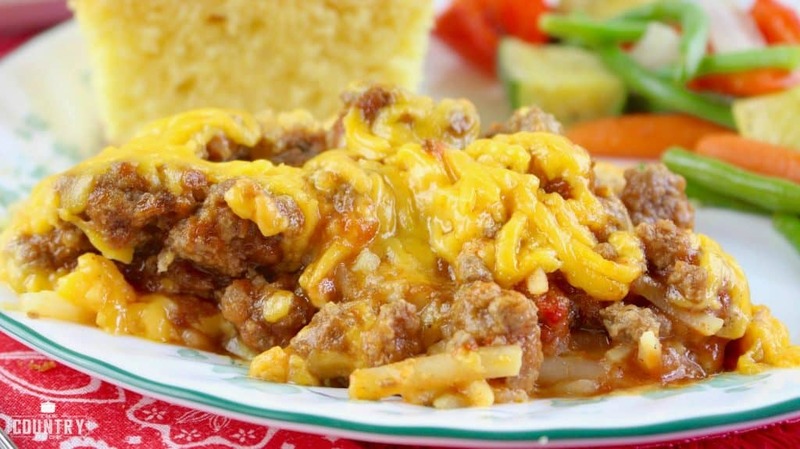 How about calling it….No Sandwich Manwich Casserole? I've made it and even my fussy eater husband loved it. When I was mixing it up….he turned up his nose at it…but ended up eating to plates full. Thanks for posting. It says 1 oz for the soup and the hashbrowns… But do i use the full bag and can? Yes Stefanie, you can do that! I have done something like this on my own using 6lbs.thawed ground turkey, 2 cans of Bold Manwhich and potates O’Brian. mixed it all together raw turkey meat and all put it in the crock pot on low of 8 hours and it was great.